Something unusual happened to Pablo Hernandez’s wife recently: Her boss asked her if she wanted to go to the bathroom. To Hernandez, it was monumental, because Hernandez left his job at the same place, the Sanderson Farms poultry processing plant, because he couldn’t go to the bathroom. His supervisors at the Bryan, Texas facility wouldn’t let him. 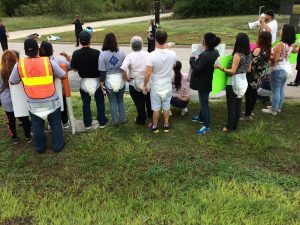 That’s why, Hernandez said, when he learned there would be a protest at the plant, “I went there happily.” Like the other 20 former employees and advocates who showed up for the October 1, 2018 event, Hernandez pulled a pair of adult diapers over his trousers. It made a great visual, and the television news crew covering the protest made sure diapers appeared in nearly every frame. Workers had complained that they weren’t given permission to go to the bathroom, a particular hardship for people with health conditions or for pregnant women. If workers left to go to the bathroom, chickens would fall on the floor or the production line would have to stop. The company wasn’t employing enough workers to step in so their co-workers could use the restroom. There were other issues as well: Better protection from the chemicals used to clean the chickens and an end to sexual harassment. You can read The Pump Handle’s on-the-spot coverage of the Oct. 1, 2018 protest here. The protesters, generally former workers at the poultry plant and worker advocates, delivered a letter to management demanding more opportunities to go to the bathroom, better protection from the chemicals and an end to sexual harassment. The protest, outside the facility of one of the region’s largest employers, was a first, its organizers say. But it mirrors protests at other poultry plants around the nation, part of a national campaign to improve conditions for workers in poultry plants. Mike Cottrell, the chief financial officer for Sanderson Farms, denied the allegations. If paradise is defined as permission to pee when necessary, it has been achieved, at least for the moment. But the leaders of CDL, which organized the protest, aren’t leaving it to chance. The bathroom permissions and the company’s willingness to pay for more protective equipment (the workers used to have to buy their own if initial company-issued aprons and gloves tore) will be monitored by worker committees. “The committees will supervise that things are going well, and in case they are not, they themselves can begin to make changes inside the plant. They are going to be their own leaders; we are just supporting them,” said Ana Lopez, one of CDL’s leaders. Lopez is a pseudonym, used to protect her privacy. The committees will also pressing for more reforms, particularly to issues involving the Family and Medical Leave Act. A growing concern is the use of robots in the plant and how they’ve already allowed the company to increase line speeds, CDL’s leaders say, pushing workers to keep up. “We keep talking with workers and we are on top of things. We’re vigilant,” said Alma Garcia, a pseudonym used for another Centro leader.